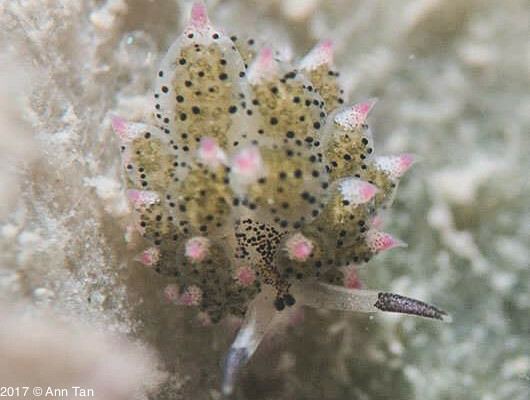 By Ann Tan: A lot of people say, that there is no difference between day and night dives at Pulau Hantu (because low daytime visibility makes day dives seem like night dives! ), but I think otherwise. 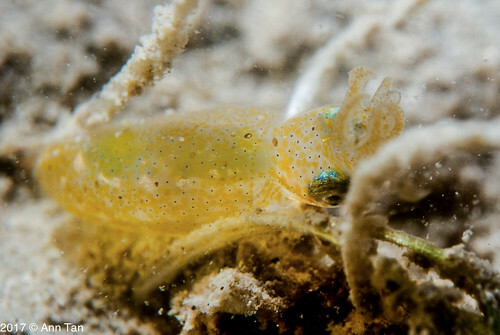 Pulau Hantu has its own unique critters of the night. I became obsessed with night dives at Pulau Hantu about 6 -7 years ago after seeing some critters I’d never seen during the day. Since then, I have seized every opportunity for a night dive at Pulau Hantu. Tonight’s dive site was a little bit special. I had been to this site only during the day but never at night. 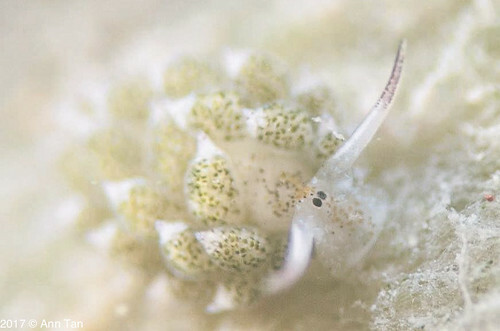 I’d expected to see more active head-shield slugs (Cephalaspidae) and “Shaun the Sheep” (Costasiella sp.) as I had seen these during the day. Most of all, I was hoping to encounter critters that were even more rare, and unseen during the day. On my first dive, I made a beeline for a green blade of algae where I’d last seen “Shaun”. The first leaf I found, there Usagi (i.e. Costasiella usagi) was. 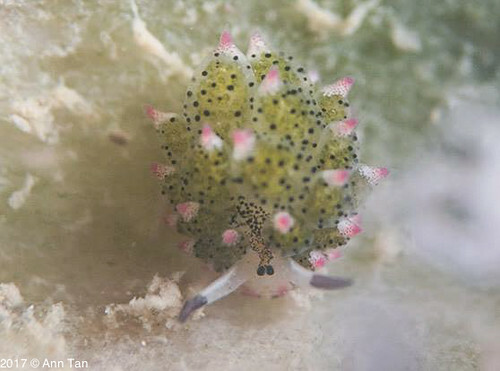 Above is one of the “Shaun” species commonly found in Singapore waters. I moved on to find a second species, that is much more rare in local waters and I found it after going through 2-3 blades of algae. Above is Costasiella sp., one of my favourite “Shauns”. Much greener, much whiter on the face. 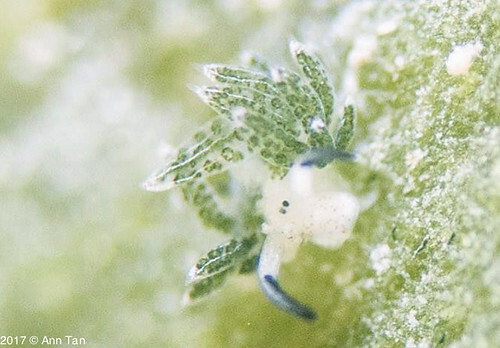 Into the second dive, my captain told me there was another patch of sandy bottom where the white-faced Costasiella sp. could be found. After getting some directions, I jumped in the second time. But before that, I’d heard that a diver encountered a pygmy squid. So I decided to pay the pygmy squid a visit before finding the treasure. 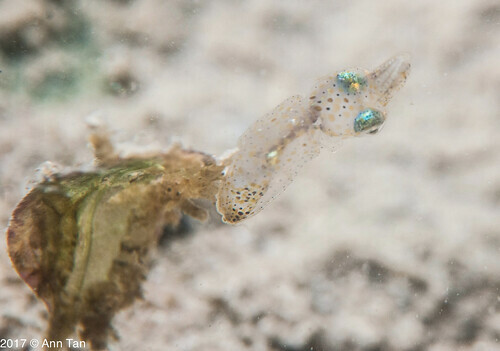 This is a young pygmy squid. 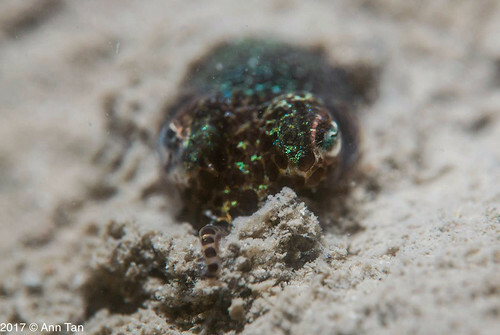 There was a adult pygmy squid nearby (below). Much more yellow in colour. It’s as if the adult was teaching the young how to hunt. 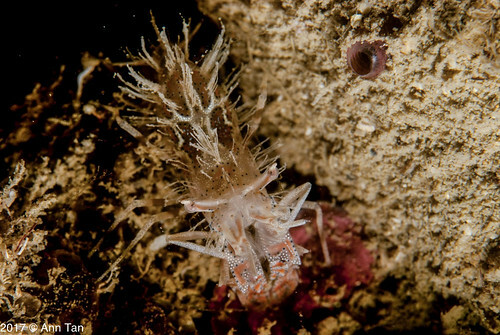 It’s easy to get distracted during a night dive at Pulau Hantu. But I had to move on! I headed in the direction I was instructed. Along the way, I came across a shrimp. Night dives at almost all resorts in the region typically end before 9pm. At Pulau Hantu, we jumped in for the last dive at 8.30pm the earliest. Bear in mind, this is a really DARK night dive. On my way to the last destination, I realised there were no other divers following me. I came across a patch of green algae (Chlorophyta). I thought I was near the reef that I was supposed to end up at. But no.. beyond the green patch was even more sandy bottom. Worried that I might be lost and unable to get back to the boat, I decided to spend a bit more time at the algae patch before heading back to the boat. 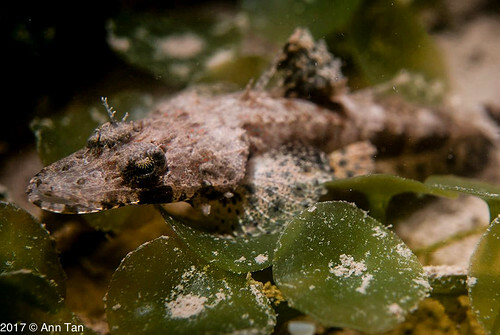 Something rustled and I turned my weak torch to find a juvenile crocodile fish (Cymbacephalus sp.) which I have heard of but had never seen with my very own eyes. 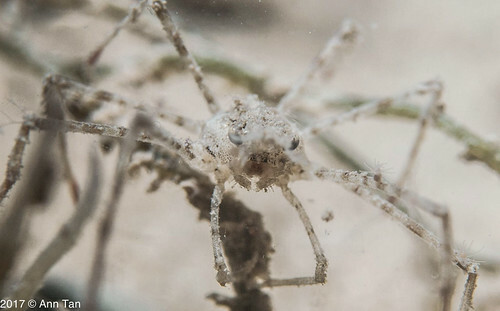 A spider crab.. It’s feeding! I could see it putting stuff into its mouth! The slugs here are probably much more active during the day so I didn’t see any. Although I couldn’t find the “prized Shaun” that the others had seen, I managed to find these other prized findings of Pulau Hantu: Critters of the Night. 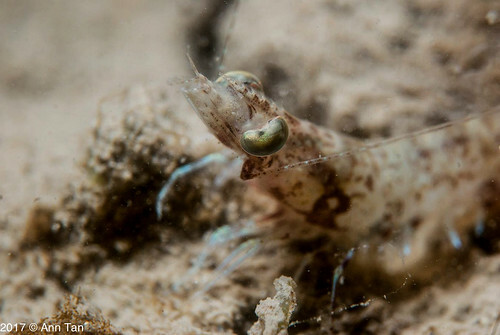 Not to mention, I’d encountered a Tiger Shrimp Phyllognathia ceratopthalma (below) on one of the night trips previously. It’s still one of my favourite encounters from this special home reef! Brilliant! These are prized critters people pay thousands of dollars to see at the fabled Lemberg Straits and there they are just sitting in our Singapore’s backyard. Hi there! I happen to chance upon the blog while doing some research about the biodiversity of Pulau Hantu for a project for my course (MSc Environmental Management). 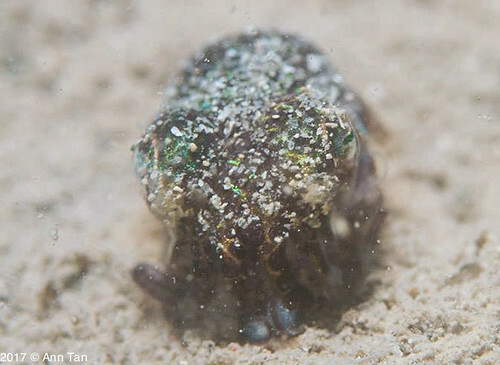 This blog is such a good repository of species found in Pulau Hantu! It must have been a tough journey, but thanks to people like you who chronicle the findings do people like me get to find out about them! I would like to enquire, if you happen to have compiled a list of species you have spotted in P. Hantu thus far and if it would be OK to share it? If you want to find out more about the project I am doing, I will be more than happy to share with you.